Is it time to move your website to a different WordPress hosting provider? What about transferring your site to the WordPress platform? Sometimes the grass is greener on the other side! You might find that either a different provider or platform is the breath of fresh air that you and your site need. But…there’s the problem of actually making the change. It sounds like a good idea until you actually have to do it, right? Moving your site doesn’t have to be a big deal. There are plenty of resources for migrating your site if you’re interested in doing it yourself. But what about hiring a professional WordPress migration service? That’s definitely an alternative to dealing with site migration on your own. What is a WordPress Migration Service? 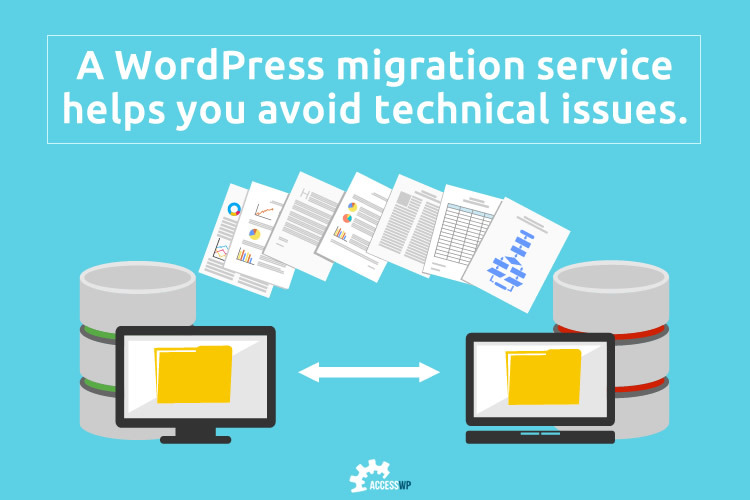 In general, your website’s files, data, and domain are moved from one server to another during WordPress migration. Sounds simple, yes? However, there’s more to the process, including server and file configuration, redirects, and other protocols. There are plugins and online guides to help you migrate your site. However, nothing replaces a professional migration expert. Not sure if you want to attempt a site migration by yourself? These eight reasons will convince you to outsource your WordPress migration to a service. It may seem like the internet is your best friend when it comes to site migration. Since there’s no shortage of site migration guides on the internet, you might think you’re all set. Do a Google search, find a tutorial, and you’re on your way to D-O-N-E. The typical advice is to install a plugin after which you follow a series of instructions to complete the migration. That’s all well and good until you run into an issue. Then where’s the internet to help? When you’re stuck on an issue, you don’t have the patience, time, or expertise to troubleshoot technical problems using the internet as your helper. If your technical issue is making your website inaccessible, searching the internet won’t produce a solution fast enough. Once any hurdles are out of the way, do you even know how to set up your site on the new platform or provider? Unless you have a good handle on WordPress and server configuration, you could run into additional technical problems. According to one study, 60% of availability and performance errors are the results of misconfiguration, which can cost a business thousands of dollars in downtime. In the world of technology, there are “dependencies” that make your migration work. Miss a dependency and migrating won’t be the cakewalk the internet said it would be. As a busy small business owner or entrepreneur on a budget, consider hiring an expert to migrate your site so that you don’t have to deal with a pricey or time-consuming technical crisis. Some estimates show that U.S. businesses lose $84,000 – $108,000 for every hour of IT downtime! Thankfully, site migration experts are pros at limiting downtime. In fact, a WordPress migration service often requires NO downtime. What a relief! If something does happen while migrating your site, professionals will take care of it immediately and know exactly what to do to save the day (unlike you). In theory, doing the site migration yourself saves you money, time, and hassle. In reality, not outsourcing this task to a WordPress migration service means the opposite! configure server settings, email, theme settings, etc. Letting an expert migrate your site means that in a few days the task is finished. No pain on your end at all! Plus, a professional migration service does the work at night and keeps your site running with very little to no downtime. Your job is your business, not becoming a WordPress technical expert. Trying to do a site migration yourself consumes way too much of your time and will have you daydreaming about a spa visit to detox from the hassle. Even the best-laid plans run risks, and one of the biggest risks with migrating your site is data loss. Losing data is a harrowing experience. Have you ever had your computer’s hard drive die without a backup? Imagine that scenario with your website data. Without a backup, it’s as if your office burned down and you’re starting your business from scratch. Data loss is so serious that it contributes to companies filing for bankruptcy and closing. 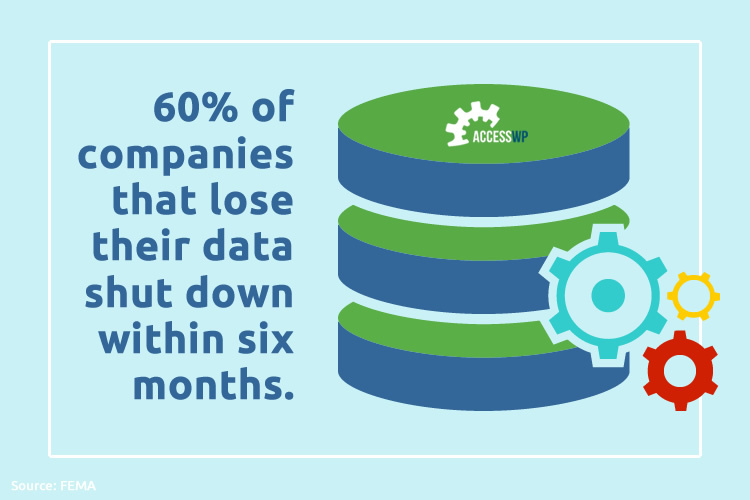 According to FEMA, 60% of companies that lose their data shut down within six months. A migration service ensures that your site is backed up BEFORE migrating your site. You don’t want to move any of your files and data without a solid, stable backup first. You may feel confident that you can backup your own site. But, have you ever tried to restore your data from a backup? Don’t assume restoring your site is as easy as backing up your data because it’s not. Professionals have the knowledge and tools to restore your data if something goes awry during migration. You have many talents, but if WordPress isn’t your area of expertise, then why take a risk migrating your site? We’ve already discussed what you’re facing if your site goes down, you lose your data, or you have a technical issue you can’t resolve. Using a migration service gives you peace of mind. You let an expert manage the entire process while you do something else in your business (and there’s plenty of other stuff you can do!). There’s no need for you to dabble with servers, data, configuration, backups, protocols, plugins, email, hosting, and code. Your website is too valuable to use as a WordPress training tool. Experienced WordPress professionals know technology in and out. They know how to avoid technical problems as well as what solutions work if the worst happens. With a proven process in place, a WordPress migration service takes care of moving your site while you sit back and relax. Knowing that a trusted expert is handling your site migration is well worth giving up the stress of doing it yourself. A migration service offers one benefit that you’ll never receive if you transfer your own site: a satisfaction guarantee. If you’re dissatisfied with yourself, you’re out of luck! ? A guarantee is an assurance that if anything goes wrong or you’re not happy with your site’s migration, a company stands behind its work. Don’t underestimate peace of mind. Accidents happen, and you want to be certain that the migration service you select acknowledges that fact with a satisfaction guarantee. At AccessWP, we offer you a 30-day money back guarantee, which applies to all of our tasks, including site migration. You may be wondering, “how can paying someone else to do a job save me money?” It does seem as if outlaying money is an expense. In the long run, however, here’s how you save money. Issues that arise as a result of a faulty migration can cost you money and time. For instance, when your website goes offline, you lose sales as well as your email. Being incapacitated on such a level can really hurt your business and your bottom line. You’re really missing the boat if you pass on migration services that are free! That’s a great way to save money. ? Some WordPress migration services charge you nothing to move your site. Usually, there’s a stipulation, such as using their preferred hosting provider. AccessWP offers free migration to the WP Engine hosting platform (through their affiliate link). Now that’s a good deal! We talked about this previously, but your time is worth money. Depending on what your time is worth, it’s likely that hiring a migration service is less money than doing the migration yourself. One aspect that business owners usually fail to consider is what happens after you migrate. Now that you have a website on a new platform, do you know how you’ll maintain it? Once the migration is complete, most services, including AccessWP, support your WordPress site with website maintenance tasks, including malware removal, security scans, monitoring, and content changes. Maintenance support services are particularly helpful when you’re new to the WordPress platform or don’t have a technical background. Using a migration service gives you the perfect opportunity to outsource your WordPress maintenance, which gives you more time to grow your business. When you factor in all of these considerations, hiring a WordPress migration service is the safer, quicker, wiser, more cost-effective choice for moving your site. While migrating your site yourself seems doable, is it worth it? Dealing with revenue loss, stress, technical issues, and hassles when an expert can take of your migration for free seems silly! If you’re interested in migrating your WordPress site to WPEngine, please contact us. We’re happy to migrate your site for free when you sign up for WPEngine through our affiliate link. AccessWP fearless leader and lead marketing strategist. He also manages a web design company at Marketing Access Pass. He likes to sneak in a few games of Clash of Clans on his iPhone, and is a huge Walking Dead fan.